The Moderator is urging people of faith to take the opportunity today, World Religion Day, to celebrate our faith and to encourage interfaith understanding and harmony by recognising the common foundations which unite all people of faith. Rt Rev Susan Brown, who this month has been visiting the Church of South India, says her own understanding of ecumenical and interfaith work has been enriched by meeting and talking with people of other faiths over the last year. Rt Rev Susan Brown on a visit to India with the Church of South India earlier this month. “In the Highlands of Scotland there are not so many opportunities to be exposed to those of other religions and faiths,” Susan said. “In this year as Moderator, however, I have had the opportunity to share in conversations and meals with people who come from a wide variety of faith backgrounds, both in Scotland and further afield. “I have visited Christian churches in all sorts of other places: from the Scots Kirk in Rotterdam, to our partners in the Waldensian church in Uruguay, to the congregations I write this note from, in the Church of South India. “Often, these places are places where Christianity is just one religion among many and often Christians are in the minority. “For many church-goers, life is lived daily with the reality of friends and neighbours who worship not only in different ways, they worship different gods. “Sometimes that creates difficulties and, in extreme circumstances, it leads to persecution. When that happens all involved are diminished – perpetrators as well as their victims. “It is also true, however, that often those of different religions are able to live side by side and, in very practical ways, they get on with each other and contribute together to creating healthy, welcoming and inclusive communities where they are. 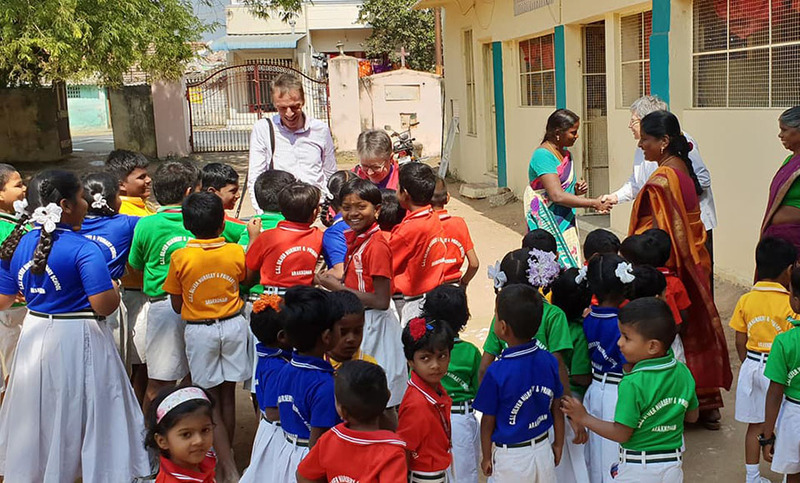 “In the last few days I have visited several projects in the dioceses of Madras and Coimbatore where the local Christian communities (minorities in their land) are committed to serving those around them with and in the greatest need. “They provide schooling and healthcare for the poorest children and have set up schools and homes for those with physical and learning difficulties - children as well as adults – whether they are Christian, Hindu or Muslim. “One project, supported by the Church of Scotland’s HIV programme, offers help to women and children across the faith communities, who have the HIV virus and who are shunned when they go to buy food, or get on a bus and also when it comes to getting work. “In this project they feel welcomed. As they are. “But this cross-faith working together happens in Scotland too. “I visited a food bank project in Glasgow Hillhead where the Church opens its premises to those who need food support. Once a month, a group of Muslim women prepare a meal for everyone who comes. “All religions call for their followers to live respecting themselves, others and the world. “We may not all agree theologically, but we do all know the worth and value of each day and of all those who share that day with us. The Church of Scotland works with bodies such as Action of Churches Together in Scotland (ACTS) and the World Council of Churches (WCC) as part of our belief that, at local, regional, national and international levels, churches ought to act together, except where deep differences of conviction compel us to act separately. Through the World Mission council the Church nurtures working partnerships with churches across Africa and the Caribbean, Asia, Europe and the Middle East. This year the Moderator will also reach out to new friends in South America as she travels to visit churches in Uruaguay. And in a world where people of faith can be at risk simply because of their religious beliefs, the Church is working to build interfaith understanding both at home and overseas. At the end of last year, the Church of Scotland World Mission Council published their interfaith engagement report on Living Together in a World of Religions. You can read the report and download the accompanying resources here.